BANEPA, Aug 5: Ubiquitous learning or u-learning; is not yet a much heard term in the country. However, this ‘portable’ teaching technique is being adopted to teach community kids in some districts including Banepa. Materials developed by the computer department of Tribhuvan University and Kathmandu University, apart from those imported from other countries, are being used in the classrooms. This has made learning a great fun and quite effective, according to reports. “Earlier, there was e-learning. Now, u-learning is in practice in several parts of the world and now here, too,” said Dr Purushottam Kharel, associate professor at the Department of Computer Science and Engineering of Kathmandu University (DoSCE). “Actually, u-learning is an amalgam of today’s mobile learning with yesterday’s e-learning,” he added. Mathematics, English and Science subjects have always been challenging for most of the students. Student performance reports show that this is more so in community schools. However, u - learning has made a difference in this, too, according to Kharel. “Students weak in subjects like English, Mathematics or Science have also shown great improvements after the use of u-learning methodology in classroom,” he said. While only 20 to 22 percent of students had passed in those ‘hard subjects’ in the past, 80 percent of them got through the exams after they attended u - learning classes. According to Kharel, the students had sat for test after the third month of introducing the teaching methodology. 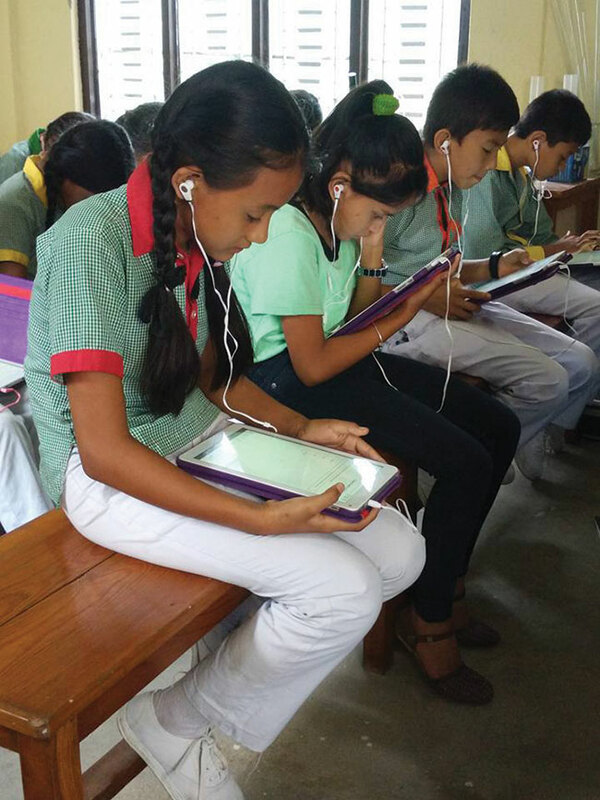 According to Kharel, the latest learning technology is being used in nine community schools in Dolakha, Saptari, Sindhuli, Chitwan and Kathmandu as a pilot project. Since the reports are very encouraging, there are plans to expand it to other districts as well. “Students are finding it very interesting. It totally removes the boredom in class and keeps them very engaged. They learn with a great fun and interest,” said Kharel. In traditional teaching methodologies, students tend to forget lessons quite easily. However, balanced audio-visual materials stay deep in their memories, according to Kharel. “They do not forget things learnt that way as they can visualize things for a long time,” he stated. In the traditional learning, teachers enter classroom with chalk in hand. But here, they carry a small suitcase with projector, battery, portable server and speaker inside it. With the tools, teachers can teach students both ‘online’ and ‘offline’. Kharel stated that presently other 100 schools are under consideration for expanding the teaching methodology in the long term and a few for the immediate future. 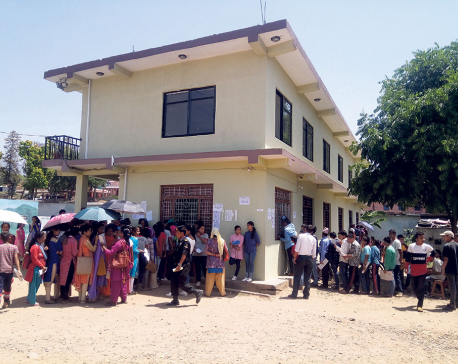 Of these, the methodology is expected to implemented in 12 schools of Mandanduepur Municipality of Kavre, 11 schools from Namobuddha and in 14 schools from Sindhuli districts. “We are trying to make it more effective. The IT park of KU is working on this. Research and training are going on simultaneously to expedite the development of a curriculum that is suitable for u - learning for students from standard one to seven,” Kharel further explained. “And here too, we are focusing on the hard subjects,” he said. English, Mathematics and Science are being prioritized while developing the curriculum to fit for u - learning. This will be of great help to students, he noted. “It is sure to bring a transformation in the learning process. It will be far easier for students to learn through the devices,” he stated. While KU is contributing that way, TU is also engaged in developing the materials. Its Department of Information and Technology has been working on it, too. According to Kharel, the use of multimedia is being focused by both TU and KU course developers. “Audio, video, texts - all are mixed to make the learning process effective,” he said. He informed that 48 students and 61 teachers were brought to the lab and provided with training in three phases on u - learning. Now, teachers themselves can develop the content, he remarked. “Labs have already transformed around 80 percent of contents of the text books. Major subjects were chosen for that. Curriculum of one to seventh graders have been complete presently,” he said. He said that they plan to coordinate with local bodies and expand the learning process to more schools. This program started in Nepal last year while it has been use in South Korea, Indonesia, Vietnam, South Africa, Magnolia and Haiti for a long time.